How Safe Are TabBand Max Temporary Collars? Glance at the counter on the lower left of this page and you'll see we’ve made a lot of wristbands for people and temporary animal collars for pets. Over one billion, in fact, during the 50 years TabBand has been in business. How many reports of strangled animals have we received? Two. About 15 years ago, we were told of a goat kid strangled when the horn of another animal slipped between the band and the kid’s neck. And a person reviewing TabBand Max collars on our website a few years ago reported a dog died. Both were tragic events. We don’t want to lose any animals—but clearly such things are extremely rare. We can’t know whether the collars were put on loosely or tightly. (We recommend leaving just enough slack to slip two fingers under the collar.) If the collar is tighter, there’s less chance that something will be able to get caught. Obviously, millions of pets wear unbreakable permanent collars safely. Nonetheless, we receive requests from time to time from animal shelters or hospitals that would like the animal id bands to break when stressed. They don’t want to take any chances. So here are two techniques they use to create a breakaway band from our TabBand Max collars, which are designed explicitly to stay on and not fall off. The first takes some finesse: to double back the ”tail” of the band through the adhesive section to reduce the sticking power of the very powerful adhesive. Simply attach the collar with a portion of the available adhesive. 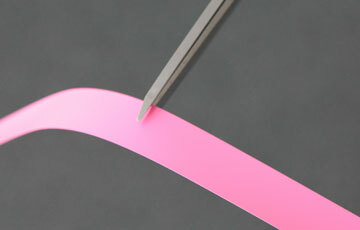 The second technique is much easier: just snip part way through the width of the band with scissors (see the photo of the pink band). Halfway seems to be the right amount. With the collar weakened in this way, it snaps readily when stressed. Clearly, we think TabBand Max collars work best when they stay on, but we appreciate the concerns of people who worry about hurting the animals and find these two techniques will address those concerns. If you’ve seen the counter on our website, you know we’ve made a lot of wristbands for people and temporary animal collars for pets. Over one billion, in fact, during the 50 years TabBand has been in business. How many reports of strangled animals have we received? Two. About 10 years ago, we were told of a goat kid strangled when the horn of another animal slipped between the band and the kid’s neck. And a person reviewing TabBand Max collars on our website reported a dog died. Nonetheless, we receive requests from time to time from animal shelters or hospital s that would like the animal id bands to break when stressed. They don’t want to take any chances. So here are two techniques they use to create a breakaway band from our TabBand Max bands, which are designed explicitly to stay on and not fall off. The first takes some finesse: to double back the” tail” of the band through the adhesive section to reduce the sticking power of the very powerful adhesive. Simply attach the collar with a portion of the available adhesive.